My oh my – Cooking Light is two for two in my books so far. 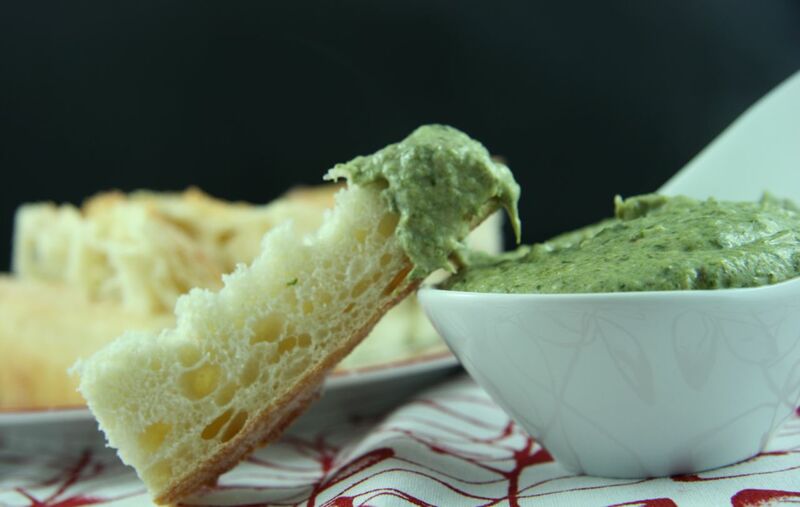 I warned you guys that I was really impressed by the magazine, and it only took me a few days to whip-up another recipe that went straight to the front of the “must-blog” list – it was truly that delicious. I have had these jumbo pasta shells in my cupboard since last year…I always wanted to make stuffed shells, but we aren’t the biggest pasta fans (read: I am not and I’ve gotten CH on board with spaghetti squash as a replacement!) 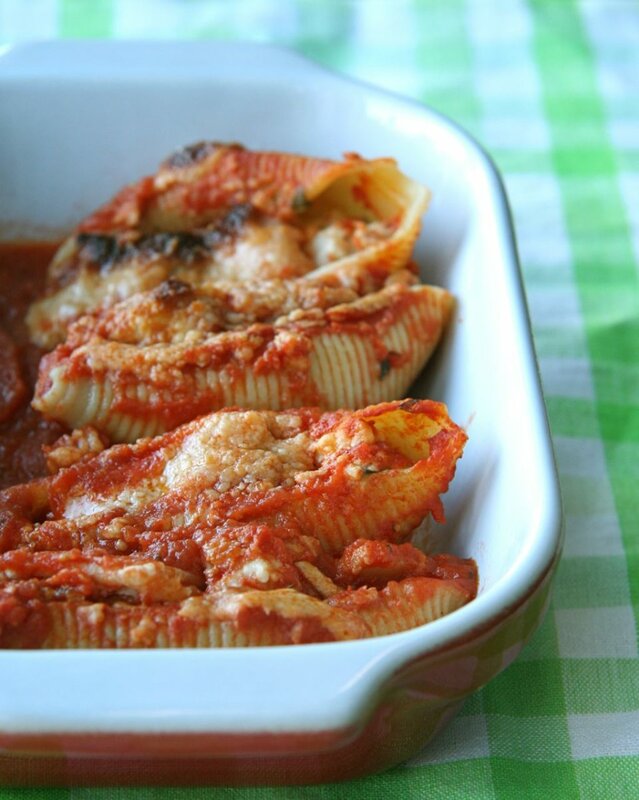 so something always trumped one of the recipes I came across for stuffed shells…until this one. This recipe was truly one of the most delicious pasta dishes I’ve made and I love that it has shrimp. The creamy texture of the filling is also very welcomed in my books. But the best part of this recipe is that it is”light” especially when it comes to baked pasta dishes. Another slam-dunk for CL. CH and my friend who was my recipe tester (thanks CA!) both couldn’t believe how delicious this dish was, especially given it’s very friendly calorie count (see below!). It is definitely a make-again, and leftovers were well received too (it reheated beautifully for a pasta dish). If you like shrimp, creamy filled, baked pasta with a beautiful tomato sauce, definitely give this one a try. Bring a large pot of water to a boil over high heat. Cook the pasta shells for 7 minutes or until almost al dente. Do not add any salt or oil to the water. Drain well and set-aside. Heat a medium skillet over medium heat. Add oil to pan and swirl to coat. Add the onion or shallots to the pan and saute for 4 – 5 minutes, stirring occasionally until the onions are translucent. Add the garlic to the pan and saute for an additional minute. Add the cream cheese, milk, and red pepper flakes to the pan and cook until cream cheese melts, whisking until smooth. Remove from heat and stir in basil. Set-aside for a few minutes. Once shrimp have been de-veined, peeled and coarsely chopped, be sure to dry them off with paper towel. Place shrimp in a bowl and sprinkle with the corn starch – toss well to coat evenly. Add the shrimp to the cream cheese mixture and stir to combine. Coat a 13 x 9-inch glass or ceramic baking dish with cooking spray. Spread 1 cup marinara over bottom of dish and arrange empty shells in the pan (makes clean-up a little easier to do it this way!). Divide shrimp mixture evenly among pasta shells – about a tablespoon in each shell. 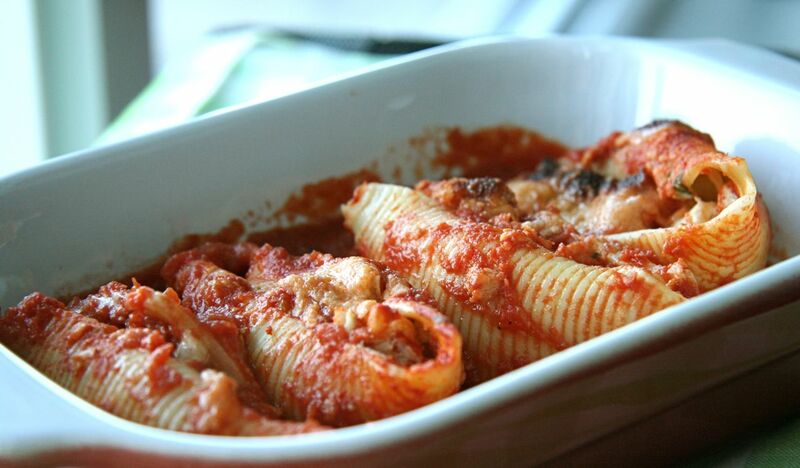 Once all of the shells are filled, top them evenly with the remaining 2 cups of marinara sauce. Sprinkle shells evenly with the grated Parmigiano-Reggiano cheese and cover with tinfoil. Bake at 400° for 15 minutes, remove tinfoil and bake for an additional 15 minutes or until shrimp are done (they will be opaque). 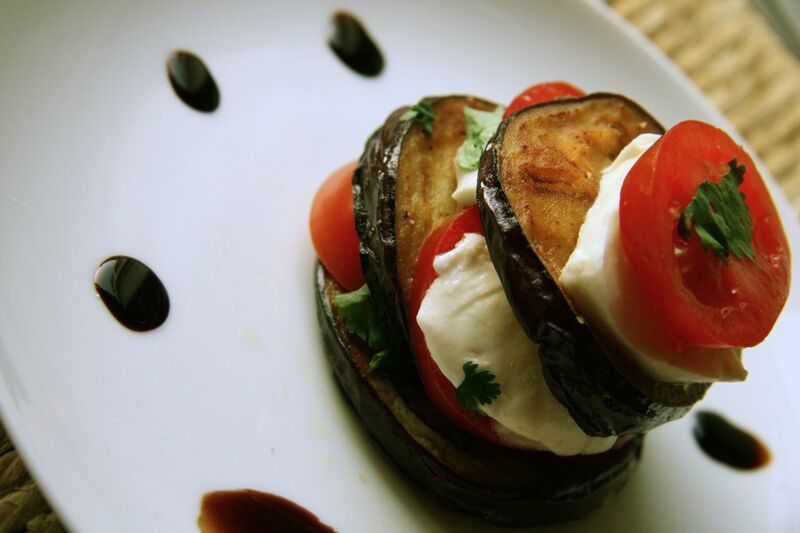 Fresh market tomatoes, basil, mozzarella cheese and crispy eggplant make for one of the simplest summer pleasures. This salad highlights three of my favourite foods: eggplant, tomato and cheese. This salad was so good, I could have eaten it every day of the summer. Sadly, I ran out of eggplant – but I did eat it two nights in a row, which is very unusual for me. I don’t like leftovers or having the same thing over and over, but this salad was different. This salad came to be kinda by accident actually. I knew I wanted a tomato and mozzarella salad for dinner, something nice and fresh. But when I opened my vegetable drawer, this little eggplant was looking at me sadly and was on the last stages of its life. I knew I had to use it up quickly, but couldn’t decide how. I realized the eggplant and my tomatoes were about the same size and that is how this dish was born. CH is back in Canada for 3.5 weeks, however he was still able to ‘share’ this dish with me. I was chatting with him on Skype (btw – Skype is the greatest invention since the computer, IMO) and his jaw literally dropped when I came wondering into the room with this gorgeous looking creation. He immediately instructed me to photograph it for the blog, but I couldn’t wait any longer and devoured it immediately (sorry, I know that’s so wrong of me as a food blogger!). However, as I mentioned above, it wasn’t long before this was on my table again, and this time I made sure to nibble away before plating it, just so I could get through photographing it! Anyways, I hope you enjoy this dish soon. 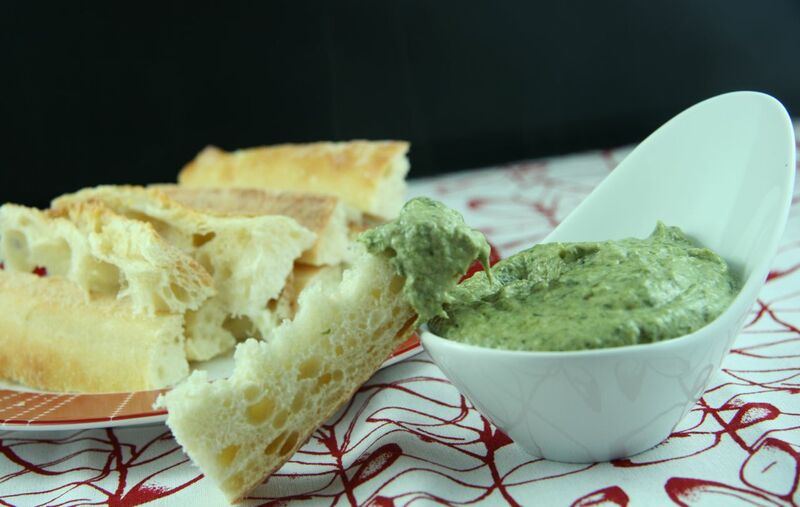 If you aren’t a fan of eggplant, simply omit it. But with tomato season upon us, don’t omit this one from your repertoire. Slice eggplant into 1/2 inch slices. Rub both sides of the eggplant slices with garlic cloves (switch garlic halves about half-way through). Sprinkle both sides of the eggplant with salt and pepper. Place flour in a shallow bowl. One by one, place each piece of eggplant into the flour, press down lightly to coat the eggplant evenly. Tap lightly to remove extra flour. Heat a large frying pan (or sauté pan) over medium-high heat. Add the oil and heat until glistening. Add the eggplant slices and pan-fry for 2-3 minutes per side. Keep careful watch as not to burn them. If they brown too quickly, lower the heat. Flip each slice over and cook the other side, until nice and crisp (and golden brown). Remove from frying pan and place on paper towel to drain off excess oil. 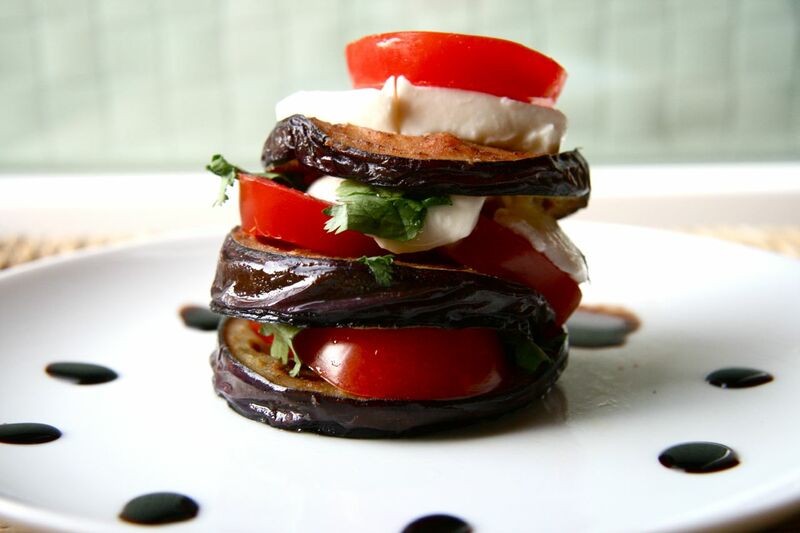 Place a piece of the fried eggplant on your plate, top with a slice of mozzarella, 1 leaf of basil and a slice of tomato. Repeat the layers until all ingredients are used up. Drizzle the salad with the balsamic vinegar and 1 TBSP of olive oil (if desired).